Mount Damavand, Iran – The Original Mount Doom? Ran across this volcano via the Mirova web site. We haven’t spent a lot of time looking at volcanoes in Asia over the last couple of years, especially in hard to visit places like Iran. Mount Damavand or the Damavand Volcano is the tallest volcano in Asia. It is an almost perfectly shaped stratovolcano topping out at over 5,600 m. The volcano is considered to be dormant, though it does have an active fumarole system. It is located 66 km NE Tehran and 70 km south of the Caspian Sea. It is the 12th most prominent mountain in the world. There are around 2,300 within 10 km of the volcano with nearly 12 million within 100 km (Tehran). Like a lot of remote, large mountains in Asia, Damavand has a significant presence in local mythology. It shows up in Persian, Zoroastrian and Iranian legends, myths and literature. There is a bit of speculation that Tolkien had some tangential Zoroastrian influence in a few of his writings. But the religious influence could have just as easily been his legendary friendship with C.S. Lewis and their determination to bring their Christian worldviews to a wider audience. He was familiar with various mythologies. Given the prominence of Damavand in Zoroastrian and Persian mythology, it is not complete speculation that it was a possible model for Mount Doom of the Lord of the Rings and The Hobbit. The surrounding region hosts brown trout, sheep, goats and a variety of smaller mammals. There are a number of bird species in the vicinity of the mountain. YouTube video of climb on Damavand. Note welded tuff behind the climber. Mount Damavand is an intraplate volcano around 600,000 years old, primarily a tracyandesite / basalt trachyandesite construct. It is topped with a small crater and an even smaller crater lake. Most of the historic activity comes from the summit crater. There is little evidence for active or historic vents on the flanks, though climbing teams have encountered hot springs and fumaroles on the flanks. Most of the fumarole activity is at the summit crater. There is some confusion on the last statement, as the Oregon State volcano web site describes lava flow vents on the western flank as the source of the most recent lava flows. They also point to the lack of glaciation as an indicator that the last part of cone building was relatively recent. This last is also in dispute as the mountain does not have any resident glaciers today, which is mostly blamed on the extremely dry climate in that part of the world. The volcano is constructed on what is variously described as the remains of a 9 km diameter caldera, though the caldera may be better described as an amphitheater left over from one or more flank collapse events. It also has the remains of at least one flank collapse debris avalanche. Initial construction of the ancestral volcano started some 1.78 Ma. There are a couple large eruptions dated at 600,000 and 280,000 years ago. It is a massive volcano estimated at over 400 km3. A 2004 paper by Davidson et al, describes the geology of Damavand and its place in the surrounding Alborz Mountains in northern Iran. It is linked in Additional Information. 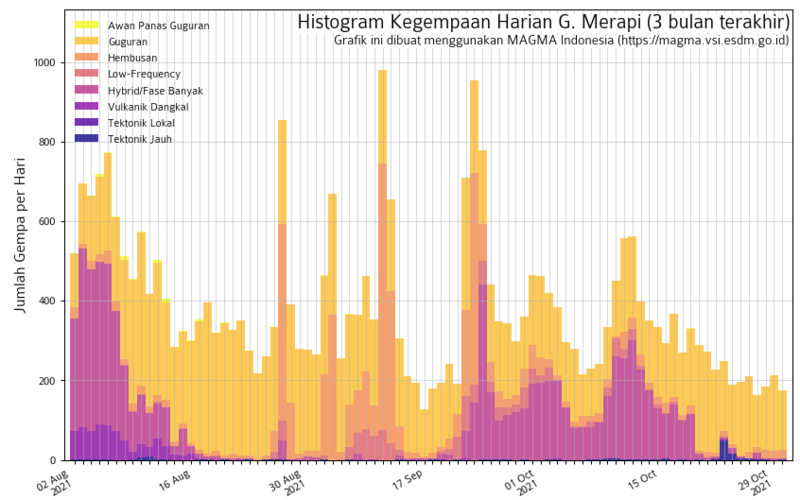 Initial activity began 1.8 Ma, though evidence for significant activity was not preserved until 1.2 Ma. Data suggests three periods of activity – 1.2 Ma to 800 ka, 280 – 150 ka, and 60 – 7 ka. One of the interesting things about Damavand is homogeneous composition of erupted materials for over a million years. Eruptive products from stratovolcanoes are notorious for mixing, changing, evolving over time. 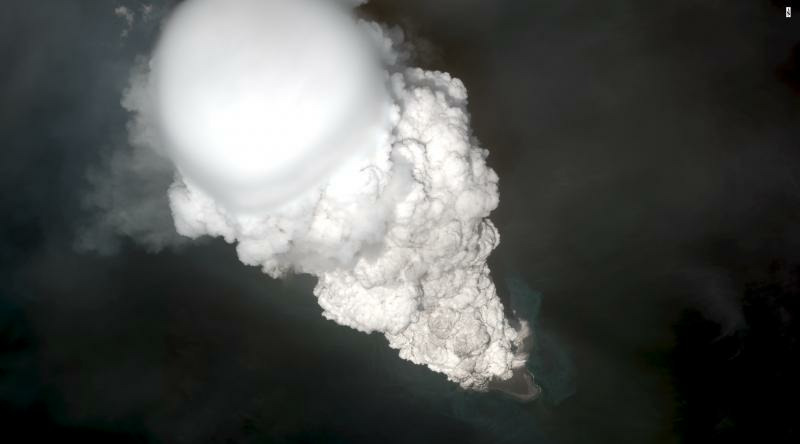 Sometimes the eruptive products even change during the course of an eruption (Katmai / Pinatubo). Not so with Damavand. Additionally, it does not appear that there was an extended period of dormancy (greater than 500 ka). Center of eruptions also shifted over time. The original center is referred to as Old Damavand while the current volcano is referred to as Young Damavand. The influence of the sector collapse event on the shift of the center of eruptions from Old to Young is unknown. Schematic of initial formation of Old Damavand. Screen Capture from Davidson, et al. The earliest activity period ejected primarily trachyandesite pumice and lavas and was centered on Old Damavand. Activity shifted to Young Damavand by 500 – 600 ka. There is a 250 ka gap in last eruption products from Old and eruptive products from Young Damavand. At least one debris avalanche is clearly below the ignimbrite deposits (named the Ask Ignimbrite) dated around 250 ka. There may have been two or more sector collapse events. There are pumice deposits dated 170 – 180 ka on the upper flanks of the volcano. Schematic of formation of Young Damavand. Screen Capture from Davidson, et al. The most recent period of activity started some 60 ka and is marked by thick lava flows that filled the neighboring Haraz River valley in places. There are levees associated with the flows and most of them are to the south. The youngest flows were on the western flank nominally dated at 7.3 ka, though their Argon age is much older at some 20 ka, leading to unresolved questions about the actual dates of eruptions. Schematic of most recent activity. Screen capture from Davidson, et al. Iran is a segment of the Himalayan orogenic system, the tectonic chaos caused by the collision of the Indian plate into central Asia. There are a complex region of faults, blocks and differing structural zones. To the west, we have the opening of the Red Sea and the northern motion of the Arabian Plate which also compresses the crustal blocks that make up Iran. There are few volcanoes in Iran, most of them to the NW corner of the country. Damavand is along a fault line in the center north of the country. Iran also has significant geothermal prospects marked by hot springs, with most of them along several of their multiple fault lines. Major collisional features of Iran include the Zagros Mountains, Central Iran, Aborz Mountains and the Caspian Basin. The Zagros Mountains are caused by the subduction of the Arabian Plate under Southwest Iran. They generally parallel the southern coast from nearly the Turkish border to the Hormuz Straits. Unlike most subduction zones, there are no volcanic structures along those mountains. Crustal thickness is in the neighborhood of 50 -70 km. It appears that convergence between Arabia and Iran stopped as the subducting oceanic slab broke off. This result is confirmed in several studies. Central Iran is roughly triangular region between the two major mountain ranges. It is generally free from seismic events and is treated geologically as a crustal block. Crustal thickness in this part of Iran is 40 – 45 km. The Alborz Mountains is an active collision belt that lies generally east – west. It is some 600 km long and generally 100 km wide. Its basement has some 1 – 3 km overlying sediments. Indeed, Damavand has exposed coal deposits near its flanks. Crust thickness is around 35 km. Tectonic motion is generally 5 mm / yr since 7 Ma. Since the Pleistocene there seems to be an acceleration of the NW movement of the South Caspian block. The South Caspian Basin has sedimentary thickness of 20 – 25 km in some parts of the sea. Total thickness is thought to be 35 km, with the crustal portion only 10 km thick. The Alborz Mountains also host the only active volcanoes in Iran, with Damavand in the middle and Mount Ararat in eastern Turkey. There are also a volcano or two in western Pakistan leading to some referring to this as a volcanic belt. I tend to disagree as the volcanoes are separated for the most part by great distances until you get in far west Iran. I find all volcanoes to be interesting. Damavand appears to me to be a typical intraplate volcano, though its longevity is impressive. It does have some features that are atypical, the relatively stable unevolved magmas for instance. It has an active hydrothermal system. Given the arid conditions where it grew, I do not find the lack of glaciers on it to be a problem. Hi. I’ve been reading posts since the first one recently, and I found this question to be the best one for a first comment. Here’s a rough translation of an extract from a french volcanology book: “Collision zones appear «a priori» less favorable to volcanism because the compression phenomenon dominates” (Bardintzeff, Volcanologie 5e édition, 2016). Some local distensions authorize ascension of magma, but that’s a rare occurrence. And btw, the “a priori” part was because after, he would describe locations where collision volcanoes do occur. Shame this particular case of volcanoes are treated as intraplate volcanism on the GVP. Makes me marvel again at the huge versatility of drones (I mean, when they are not flying into an open window to murder a handful innocent people or two). Bogoslof at RED again… with volcanic ash emission (on the basis of lightning detections). Wow looks like a *big* eruption this time, ash up to 45-50,000ft, subplinian column observed briefly. Similar to main explosions of Okmok 2008. If this is repeated a few times, it could end up at VEI-4! >>Bruce<< Here is another new paper fitting in with the conversation we had the other day (CF deformation – rising magma): Pressure evolution in shallow magma chambers upon buoyancy-driven replenishment Access sci-hub: DOI: 10.1002/2016GC006731 I haven’t read it in full yet but it seems that inflation doesn’t necessarily always occur with magma rise. I doubt if “chambers” ever melt totally, I always imagine them with a tunnel for the liquid and the rest… er… zähe… crystal mush in a more or less degree of soft. Tunnel getting wider oder making branches when temperature and amount of magma/pressure are rising. Enjoy Pfingsten!